Depicting a courting couple and with grotesque beasts on the corners; the reverse with two small oblong cavities. Chips and very minor cracks. 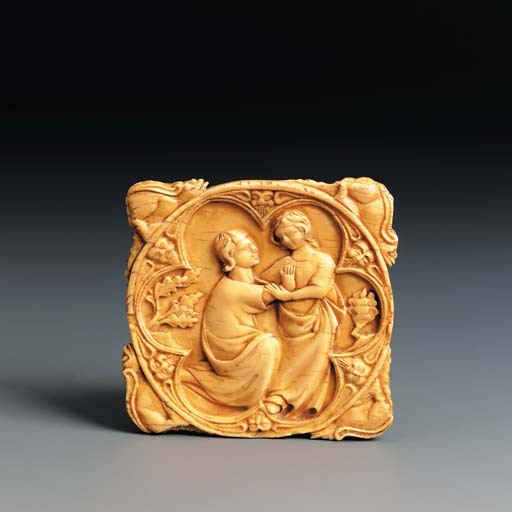 Detroit, The Detroit Institute of Arts, Images in Ivory - Precious Objects of the Gothic Age, 9 Mar. - 11 May 1997, pp. 226-7, no. 55. Milan, Museo Poldi-Pezzoli, Avori Gotici Francesi, Apr. - Jun. 1976, curated by L. Vitali, no. 14. Carved with the scene of an amorous couple within a circular space, in this instance lobed, and with four grotesque beasts on the corners, the present ivory follows a pattern of design used in most mirror cases of the 14th century. The mirror cases tended to be thin circular disks, carved in the centre with courtly scenes known from the popular romances of the time, such as the Roman de la Rose, and often squared off with four grotesque beasts, for reasons of support and ease of handling. In the second half of the 14th century these corners were usually in the shape of oak leaves (Detroit, op. cit., pp. 70-71), thus suggesting a dating of the present one to the first half of the century. The style and attitude of the figures can be compared to a mirror case in the Victoria and Albert Museum (Detroit, op. cit., no. 55) dated circa 1300-1320, in which the draperies and the poses of the figures are nearly identical to the present piece, except for the gesture of crowning seen in the Victoria and Albert Museum version. Similarly, the lobed design of the background with human masks in the angles can be seen in several ivory mirror cases of the first half of the 14th century. For an example of a similar composition, see Milano, op. cit., no. 14.